Fully furnished and ideal for long term and short term rentals. Alt to Service Apartments and hotels. How do I get my security money back? I recently moved to Bangalore, since I may have to relocate as per job need I wanted a fully furnished flat. With RentMyStay I found a flat with all amenities and comfort of a home. My family liked it. The best part about them are they don’t charge any brokerage. I was relocating to Bangalore for the job change. I was searching fully furnished home for rent, my search ended on RentMyStay. The best part was No brokerage and completely furnished home at the affordable cost. Great Work Guys. For new guys like me into this metro city, RentMyStay was a great support .The checking process was as easy as checking to a hotel. It helped me finding fully furnished rent even for the short duration without brokerage. 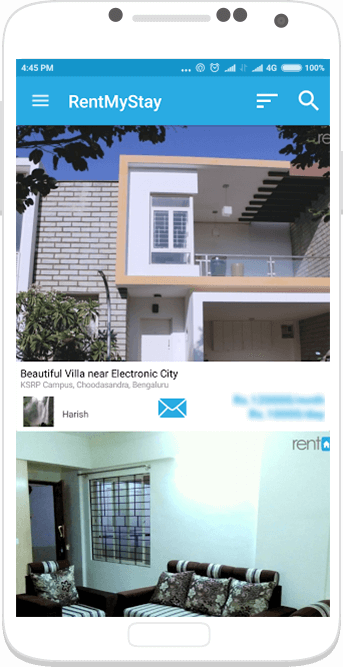 I got shifted from Chennai to Bangalore and was looking for temporary accommodation and found RentMyStay. I wanted a place within the budget of 15k. RentMyStay team helped me with exactly what I was looking for. I would definitely recommend to my friend and Colleagues. We were the group of friends who had moved to Bangalore for Internship, and we needed a place for short term and we came to know about RentMyStay who provide Flexi renting with less deposit. They have provided all the amenities and the best part was no brokerage. RentMyStay was an easy way to find flats. I was here for 2 months with family .It was a life saviour for me as I was searching for the short duration. They provided Flexi renting plus with a very less deposit, we were provided with all the amenities and comfort of a home. I relocated to Bangalore with my family and was searching for furnished apartment and found RentMyStay. As, the handover procedure got extended by a month and I had just landed from US,RentMyStay was a life saviour for us .They provided flats with no brokerage and all the amenities . All the best Guys!!! I would like to share my experience with RentMyStay. I am happy that I am able to find an accommodation with the help of RMS. My stay is good till now and the services provided by RMS is also appreciable. Definitely, I would recommend RMS to my friends and relatives whosoever wants a hassle-free accommodation in Bangalore. We feel very pleasant and luxury in your Rent My Stay apartment. We experience as if we live in our own house without any disturbance of the Land lords. I studied the motive of running such a Firm ,from your website . Your's is service oriented. When ever we happen to come bangalore, our first choice will be Rent My Stay apartment. Please continue this service continuously. I hope. It was a nice stay .. overall good experience & will surely recommend rentmystay to other people who all are looking for home kind of atmosphere in different city for short term. It was great a experience with rent my stay. Houses are well maintained, cleaned everything is proper. Rent my stay support is good.. I will Recommend for both short and long stay. RMS Rocks.. It is a very nice experience to stay with a full furnished apartment. Was really worried after coming to Bangalore for the first time with family for a job regarding my stay. Was impressed with the details provided by RentMyStay on their website. They made it easy for the overall process of move-in. Got a long-term contract. They are always available to help out with any service needs.